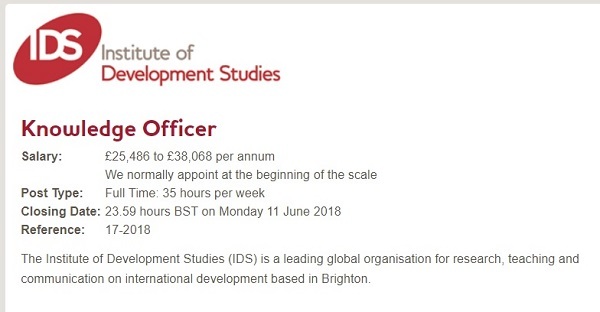 The Institute of Development Studies (IDS) is a leading global organisation for research, teaching and communication on international development based in Brighton. The role of the Knowledge Officer (Learning and Digital) is to deliver projects that support knowledge exchange and learning to increase the effective use of research evidence generated by IDS, our partners and the wider development community. The post-holder will play a vital part in helping IDS and its global partners to design effective learning approaches and support communities of practice aimed at increasing institutional and individual capability around knowledge exchange. They will work with the Digital Knowledge Manager, members of the KIP team and external suppliers to produce innovative resources, learning experiences and knowledge exchange events - both online and face-to-face. The Knowledge Officer reports to the Digital Knowledge Manager and liaises closely with the Cluster leaders, Senior Fellows and knowledge staff. She/he will also be responsible for working closely with global partners, including research organisations, think tanks, NGOs and governmental institutions and donors. As part of The Knowledge, Impact & Policy Team the post holder will support, and in some cases lead, specific projects, and contribute to the knowledge exchange components of a portfolio of research programmes as required.